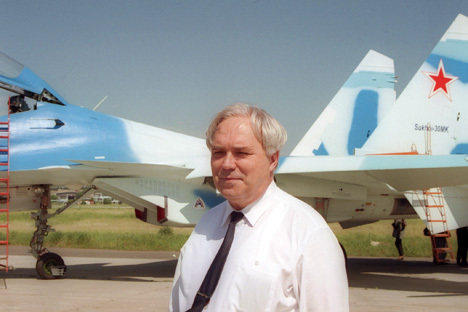 Designer-general Mikhail Simonov of the Sukhoi Design Office died on Friday at the age of 81 after heavy illness, the head of the press service of the office, Alexei Poleshchenko, told Itar-Tass. The name of Mikhail Simonov is associated with many of the most significant achievements of the domestic military aircraft-building industry. Becoming the first deputy designer-general of the Sukhoi Design Bureau in 1970, Simonov was chief controller of the flight testing and the development of the Su-24 bomber, the Su-25 attack aircraft and was chief designer of the Su-27 fighter interceptor, which became the best in the class. In 1983, Simonov, became head of the design office and made it famous all over the world, together with his colleagues, creating a whole family of multi-purpose aircraft, such as the Su-30, designed for superiority in the air, the aircraft carrier-based Su-33 and the Su-34 bomber. Simonov also led a number of other important aviation projects. With him, the basis was formed for the development of the Sukhoi company, which at present has the leading positions on the global fighter aircraft market. Under the guidance of Simonov, a whole scientific school was formed to develop manoeuvrable combat aircraft, and a concept of promising super-manoeuvrable aircraft was formulated. For his services for the Fatherland, doctor of technical sciences, professor of the Moscow State Aviation Institute, member of the International and Russian Engineering Academies and the Russian Academy of Aviation and Aeronautics, Simonov in 1999 was awarded the title Hero of the Russian Federation. He has the Order of the Labor Red Banner and the Shukhov Gold Medal. He was awarded a Lenin Prize (in 1974) and two State Prizes of the USSR (for the Su-26 and Su-27).